Aston Martin Racing - 2009 Le Mans Series ChampionAston Martin Racing is crowned the 2009 Le Mans Series champion claiming the Team and Driver titles 50 years on from Aston Martin winning the World Sportscar Championship in 1959 with the DBR1. The 007 Gulf liveried LMP1 car of Jan Charouz (CZ), Tomáš Enge (CZ) and Stefan Mücke (DE) finished third in the final round of the Le Mans Series, the Autosport 1000km at Silverstone, recording their fifth podium finish from five races. The 009 car of Harold Primat (CH) and Darren Turner (GB) finished fourth, narrowly missing the podium. The third Aston Martin Racing entry of Chris Buncombe (GB), Stuart Hall (GB) and Miguel Ramos (PT) finished 13th after suffering a technical problem early in the race. The trio of Gulf liveried Aston Martins made a clean start to the 195 lap race which commenced with a rolling start at 11:35. Mücke took the lead across the start line in 007, Turner held third in 009 and Buncombe gained a place moving up to sixth in the 008 Aston Martin. All three drivers settled in for a double stint behind the wheel of their respective Aston Martins. Mücke held first position until just under an hour into the race when he was overtaken and dropped back to second. At the third round of pit stops Mücke handed the reigns of 007 to Charouz, Buncombe switched with Ramos in 008 and Primat took over from Turner in 009. The race was trouble free for the British team until just after 2pm when Ramos reported a problem in his 008 Aston Martin. A faulty air conditioning compressor was the cause and the Aston Martin Racing pit crew worked quickly, replacing the unit and enabling 008 to rejoin the race 20 minutes later with Hall at the wheel. The race lead changed several times over the first half of the race with the top five cars all on different pit stop strategies, but at the three hour mark the Aston Martins were running second (007), fourth (009) and 24th (008) overall. Hall set about working his way back up the pack, gaining 12 places and handing the 008 Aston Martin to Ramos in 12th place after a double stint. Charouz in the 007 and Primat in the 009 also displayed strong performances during their double stints in the middle of the race. Unfortunately there were quicker cars on the track today and Enge in 007, Ramos in 008 and Turner in 009 had their work cut out in the final third of the race. All three drivers had trouble free runs with 007 and 009 pitting briefly in the closing stages of the race requiring a splash of fuel each for the final laps before the trio of Aston Martins crossed the finish line. The final race of the series was completed in 5hrs 30mins which is quicker than usual, this was partly due to the fact that there were no safety car periods in a largely incident free race. Team Principal, George Howard-Chappell: “This is a perfect end to what has been an incredible season for Aston Martin Racing. Full credit to the team and drivers who have worked tirelessly. Thanks to the dedication of the team the cars have been reliable all year. In the GT1 class, Peter Kox and Ryan Sharp finished first in their Gigawave Motorsport Aston Martin DBR9. 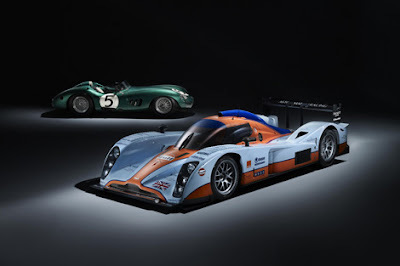 Although the 2009 Le Mans Series has reached its conclusion, Aston Martin Racing now heads to the inaugural Asian Le Mans Series race meeting in Okayama, Japan on the 31 October and 1 November.